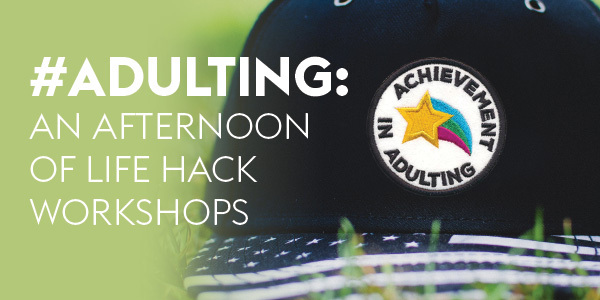 Our popular adulting workshops are back again this winter with new topics! Whether you are looking to become a more successful professional, power couple, financially literate or spiritually savy this year – workshops will be offered for 20’s and 30’s at all stages of life and topics will delve into finances, career planning, stress management, relationships and more. Q. Are all the sessions at the same time? A. No, we have 3 blocks of sessions that last 45 minutes each; you will be able to choose to attend 1 of 3 workshops in each session block. Between sessions you can visit our vendor fair. Q. Is this event for singles and couples? A. Yes! There will be 1 workshop specifically for singles, 3 workshops specifically for couples, and 5 workshops for everyone. Q. I am not Jewish, can I still attend this event? A. We welcome those of all backgrounds and faiths. Only one of our nine workshops are focused on Jewish/interfaith content. During each session block you will have the option to choose from other educational workshops. Q. Is this event LGBTQ friendly? A. You bet; some of our speakers and vendors are part of the LGBTQ community and we are promoting this event through our LGBTQ program GLOE. Q. I am part of a couple but my partner can't make it, can I still come? I have been in a relationship a year/just started living with my partner/just got engaged/am recently married - are there workshops for me? A. Of course, your partner does not need to be present to attend the couples workshops. We have workshops that range from planning your big day to staying healthy together to long term career and estate planning. Q. I own or work at a business that outreaches to young professionals and want to attend your vendor market, how can I do so? A. Please email Stacy at stacym@edcjcc.org and she will send you more information.